There sure is something special about the coziness of the season! Snuggling up with a blanket and burning a delicious smelling candle, wearing boots and sweaters, and the joy of looking forward to the holiday season and the new year. Goose Creek Candles are made in the USA with the highest quality ingredients available. They know that the faster a candle can fill an entire room with fragrance the better. That’s why they developed their candles with long lasting fragrance and a double wick system that will melt your candle to the very bottom of the jar with no waste! Goose Creek Candles has a wide variety of fragrances to suit anyone’s personal tastes. There are a variety of ways to scent your home with Goose Creek Candles too — small and large jar candles, wax melts, pillar candles and more! 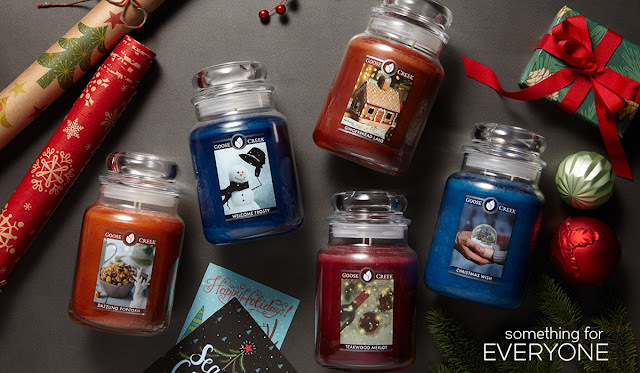 If you don’t like the look of the typical jar candles, Goose Creek has a few different styles to choose from — holiday, Chuck Pinson art, folk art jar candles and more. I enjoy the variety they have to offer! For more information you can check them out on their website and follow on Facebook and Instagram. Giveaway begins on 11/26/18 and ends on 12/7/18. Must be 18 years or older, open to residents of the US only. This giveaway is in no way endorsed, affiliated or associated with Facebook, Twitter or any other Social Media Networking Site. Please visit the other blogs in this hop for chances to win more great prizes.